Sartorial Splendor wins on debut at Terang (Racing Photos). 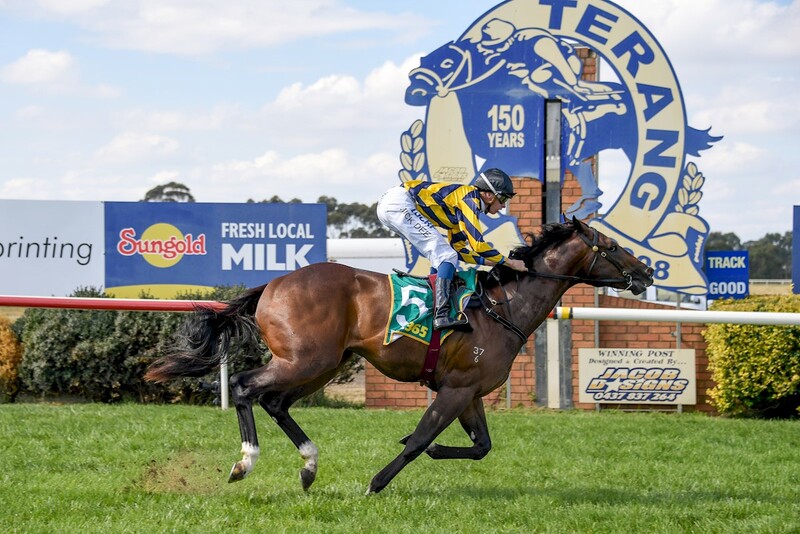 It was an exciting win on debut for the John Sadler trained Sartorial Splendor at Terang on Sunday, with the two year-old colt taking out the 1000 metre maiden plate and earning a spot in the inaugural $1 million Showdown at Caulfield in a fortnight. Starting as the $1.60 favourite and piloted by in-form jockey Michael Dee, the blazened-faced son of Brazen Beau jumped from the widest gate in the field of eleven and pushed forward to a front running position. Upon straightening, he showed his inexperience by racing greenly and looking around in the running, but Michael managed to keep him ahead of the pack to win by 2.2 lengths to Kuramae (Matthew Williams) and Exceed Rock (Mick Price). Super VOBIS and VOBIS Gold nominated as well as VOBIS Sires eligible, the horse’s big group of owners received a lovely bump up in prizemoney. Not only did they take home the first place prizemoney, they also scored the $20,000 VOBIS Gold 2YO Horse Owners Bonus! Bred by Blue Gum Farm in Euroa, Sartorial Splendor is by Darley Northwood sire Brazen Beau, out of Personal Ensign. By Oamaru Stud’s now deceased Rubiton, Personal Ensign won three of her eight starts, including the 2006 Listed Northwood Plume Stakes. She also placed in the Group 2 The Age Classic behind Magnus. She has had 7 winners from 10 foals, including Fontiton (Turffontein) who won the 2015 Group 2 MRC Blue Diamond Prelude (F) and Group 3 MRC Blue Diamond Preview (F). Owned by Victorian breeders the Campbell family, Personal Ensign has only ever been sent to Victorian standing stallions, and she is currently in foal to Manhattan Rain. Brazen Beau (I Am Invincible) was an outstanding sprinter whose performances earned him Champion 3YO Colt in Australia in 2014-15. He currently sits third on the Australian First Season Sires List by earnings ($1,076,590) behind Better Than Ready ($1,469,600) and Sidestep ($2,425,165). Sartorial Splendor, alongside smart Australian winners Tassort and Accession, stakes-placed First Dawn and UK winner Proper Beau, are helping to cement their sire’s solid reputation as a stallion. At the February Inglis Classic Sale, Brazen Beau’s Pouter colt became the highest-priced horse ever sold at this sale, selling for $550,000. He also sired the second top lot. At the Inglis Melbourne Premier Yearling Sale, his Up In Lights colt became the second-most expensive yearling ever sold in Victoria, going to Orbis Bloodstock for $800,000. Another colt (ex Sistine Princess) topped Day 3, selling for $560,000. Brazen Beau was the star sire of this sale, topping the aggregate at $4,850,000 from 17 sold. He then smashed his own highest-priced yearling record at the Inglis Australian Easter Yearling Sale when his Just Discreet colt sold to Orbis Bloodstock for $1,150,000. Bought by John Sadler at the 2018 Inglis Premier Yearling Sale for $130,000, Sartorial Splendor is now one of 12 two-year-olds in the ballot order chasing glory for Brazen Beau in the inaugural VOBIS Sires Showdown at Caulfield on Victorian Owners and Breeders Race Day, Saturday 27 April. After covering 92 mares at Darley Northwood last season, Brazen Beau now stands at Darley’s UK base of Dalham Hall this year at a fee of 7,000 pounds. He has 3 representatives at the upcoming Inglis Australian Weanling Sale and 1 at Inglis Scone Yearling Sale.